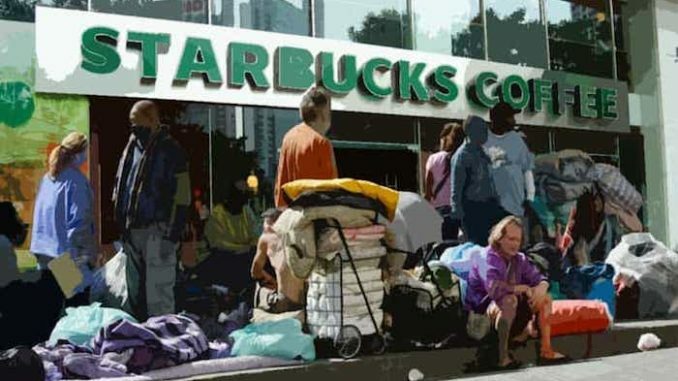 A Starbucks in California has been forced to close after the company’s social justice policies allowed the store to become overrun with homeless people and drug addicts. According to several employees at North Park Starbucks, the increasing number of homeless people being allowed to loiter in the store has led to a sharp decline in sales. 10news.com reports: “There are people camped out there all day. I noticed an uptick starting about five years ago,” said Green. “When I have family and friends that come in, they walk by and say, ‘Let’s go to another one,’” Clegg added. The closing comes some seven months after Starbucks announced customers would no longer be required to buy something to use the restroom or hang out. Critics said the policy could attract more homeless. Closures like this one are likely to add fuel to the debate. “You hate for this business to go out with a whimper,” said Green. The Starbucks opened up 13 years ago during the renovation of the North Park Theatre. Green was on the planning committee that approved the redevelopment project. “They stuck out their necks. They were one of the first businesses in. They were a catalyst,” said Green. Green says the long morning lines he saw at the Starbucks five years ago have disappeared. He hopes the closure won’t be sign of things to come. “A lot of people have put a lot of work and money into this neighborhood … It makes you wonder who could be affected next,” said Green.